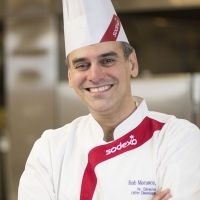 Rob currently oversees culinary development for Sodexo North America. His team manages new concepts, menus for all of Sodexo’s market segments including all new ingredients and recipes. Rob has nearly 40 years of experience in all facets of food service management, including experience at noted establishments such as the Kennedy Center for the Performing Arts and the Capital Hilton Hotel, as well as nearly over 20 years with Sodexo. Plant Based for Everyone, Part 2!